What a splendid idea. The custom printed Boiled Lollies Biz Card Box for your next marketing drive. Want to make sure that your business card is actually kept and not thrown in the junk pile? 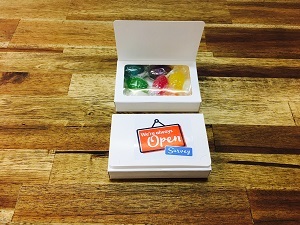 Our promotional Boiled Lollies Biz Card Box will definitely do the trick. Your business card is inserted on the inside of the Biz Card Box, along with 8 pieces of sweet lollies in assorted colours. Now, who would ever want to throw away free candy? This is such a genius move to get your name out there. With your business card inside the box, we definitely haven’t forgotten about your logo! The outside of the personalised Boiled Lollies Biz Card Box is another branding opportunity for you to blast your marketing campaign. A full colour sticker of your brand or logo can be placed on the outside of the box for maximum brand awareness and recall. 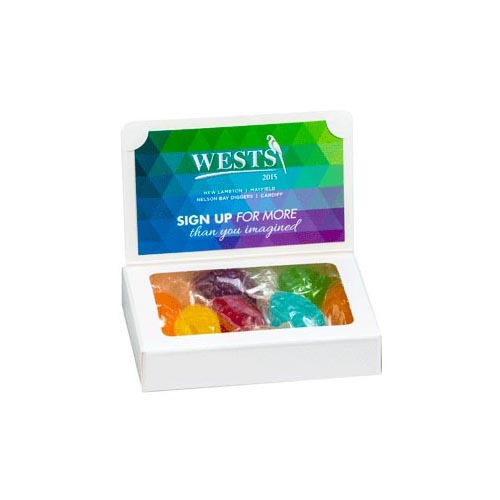 The delicious Boiled Lollies Branded Biz Card Box is a great promotional product for the opening of a new office, product launching, or a trade show giveaway. The best part? These treats will never put a dent in your wallet! If a branded Boiled Lollies Biz Card Box is not your thing, we have other candy options for you. You’ll love the corporate Choc Beans Biz Card Box or perhaps the Chewy fruits, Jelly Beans or M&Ms Biz Card Box option. We’re certain that you will find the promotional product that best suits the occasion. Here at Fast Confectionery, we offer you convenience, ease of ordering, and a fast turn-around time! 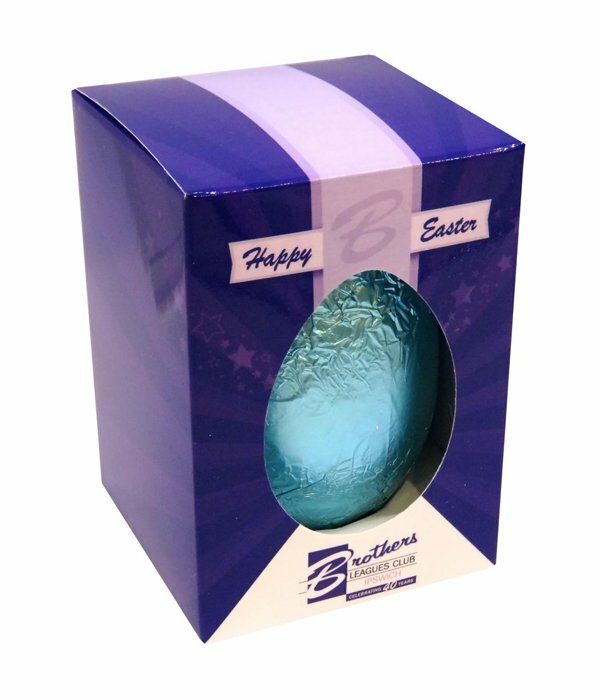 Ready to place your order of the stunning promotional Boiled Lollies Biz Card Box? We’ve made it simple for you. You can order through our website, upload a picture of your logo or artwork, and we will take it from there. A live chat function is also an option. Otherwise, call one of our sweet-tooth experts on 1300 008 300 to know more about our product offerings and branding opportunities. If you’re stuck and haven’t yet found a service-oriented supplier for your branded caps, then it’s your lucky day. We realised a long time ago that promotional lollies and printed head wear, when combined really take a celebration to a whole new level. In saying that, we have put together a super range of cap and hat choices over at Fast Caps. Go ahead, check out our range. In particular, you may like our recommended custom Garment Wash Combed Cotton Twill Cap. We hope to see you over there soon.